Moroccan hammams are one of the most unique places that you can find in this lovely country. Moroccans take hammams on a daily basis – they are a traditional ritual that becomes a social activity with men, women, and even kids participate. Separate baths are available for each gender. Citizens and, now, tourists spend hours in the hammams while socializing with friends. Morocco is a colorful nation, with a great number of hues and spices. It is a very diverse country with amazing secrets that make their life interesting – one of these secret gems lie in their beauty and bathing products, made from natural and organic ingredients. 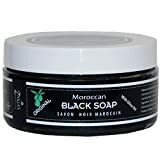 The Moroccan soaps, black soap, red clay soap, and argan oil soap, are a great example of incorporating hygienic practices with nurturing and cleansing oneself. Moroccan black soap – also known as Beldi soap – cannot be found elsewhere in the world. It has a high alkaline content, made from macerated olives and olive oil, giving it an almost gel-like consistency. The olives give it a signature dark green color. Moroccan hammams often use black soap for moisturizing, exfoliating, and cleansing. A small amount is rubbed on wet skin, followed by using “Kessa”, a coarse fabric washcloth, for up to 10 minutes to remove the dead skin. Below we talk more about black soap’s benefits. Black soap helps reduce aging effects effectively. It is rich in Vitamin A and antioxidants, which makes it helpful in promoting hair growth. It also reduces wrinkle formation and renews skin cells. If you are showing premature aging signs, this will help you greatly. Black soap is ideal for improving the texture of your skin. The vitamin E found in the soap helps strengthen the skin tissues, creating a smoother and cleaner texture. It also aids in creating a more long-lasting soap. This soap also keeps the skin protected against the many harmful substances from the environment. It shields the skin from forming discolorations and brown spots. It contains lauric acid, full of antibacterial properties that fight off symptoms of skin irritation, burns, and other painful conditions. The antibacterial properties present also help in protecting the skin from harmful agents that we encounter in our daily life. Plus, the good amount of oil and butter helps make the soap a great makeup remover. These properties combined help make black soap a perfect solution for fighting acne problems, pore blocking, and other common skin problems. Zakia’s Morocco Moroccan Black Soap is a good example of these health and skin benefits. It is perfect for dry, patchy, aging, and itchy skin. Thanks to the traditional Moroccan formula they use, it creates a luxurious feel of smooth and silky use after regular use. No artificial ingredients were added, and you can be sure that only pure and natural ingredients – including the scent – were used. It is very safe, with no mineral oils, no silicon, no PEGs, no parabens, and no animal testing present. Another unique soap from Morocco is the red clay soap. It contains high levels of magnesium, calcium, and potassium. As a result, it is a perfect conditioner and moisturizer for your skin. In fact, red clay soap has been used in the past centuries as a skin repairer. In addition to this, red clay can also exfoliate the skin gently, unclogging pores, absorbing excess oils, and detoxifying the skin in the process. The end result is smoother and healthier skin. The ingredients are all natural and gentle enough for daily use. For a more holistic view of the advantages of red clay, check out our recent post on Moroccan clay. 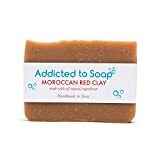 Addicted to Soap Moroccan Red Clay Shampoo Bar is one of the top red clay soaps today. As a genuine Moroccan soap, it only has natural ingredients. No harmful chemicals are found in the soap. It is safe even for the most sensitive skin types. Choose from a variety of lovely scents. The wrapping is also eco-friendly and safe for the body and the environment. Argan oil is collected from the argan tree – a unique find in the southwest region of Morocco. The tree cannot be found elsewhere in the world. The tree grows up to 10 meters and can live for a long 200 years. What makes it such a beloved natural substance is because argan oil contains beta, gamma, and alpha, and vitamin E. These render it a great skin and hair product. Here are some of its benefits. It is used both for hair and skin, as it is capable of nourishing well. Even the insides of the nails can benefit greatly from argan oil. It keeps hair shinier and prevents breakage. If you have broken hair ends, this is a great fix for that as well. The anti-aging properties can prevent future under-eye bag and wrinkle formation, and remove existing ones. Skin regeneration is promoted as well. Argan oil is great for moisturizing and softening the skin. Thanks to the Vitamin E content, the skin is treated with a natural shine and soft, supple feel. You can use it for the entire body, including the face. Pre de Provence Moroccan Argan Oil & Shea Butter Quad Milled Exfoliating Soap is a top rated argan oil soap. It increases the nourishing, hydrating, and protective advantages of argan oil, while simultaneously cleansing the skin. Shea butter enriches it to create the most indulgent skin experience. Pré de Provence creates skin and body products that follow the most artisanal traditions from centuries ago. The brand uses natural ingredients and scents, such as wild flowers, lavender, and herbs to create 100% safe and natural products. Check out our post about quad-milled French soaps and their benefits.